He begins with a helpful discussion, in which he defines the theological terms associated with the end times. Precise definitions are given for amillennialism, premillennialism and postmillennialism and other terms. As an expositor, Schnabel has chosen not to use these terms throughout his book in an effort to keep the discussion focused on the Scriptures. This is refreshing and places the focus on the text rather than theological systems. Next, Schnabel discusses his method for interpreting the eschatological passages of Scripture. He states that the text must be interpreted according to its “historical, cultural and linguistic context,” which is the way that all Scripture should be interpreted. However, then he states that he will interpret the text symbolically rather than literally. According to Schnabel, interpreting end times Scriptures literally whenever the text will allow is “an illegitimate demand because it leaves the decision when to interpret literally and when to interpret symbolically up to the modern interpreter.” (pg. 12) Schnabel concludes his discussion on interpretation vowing to use clear passages to interpret unclear passages, but he does not follow his own advice. For example, in Revelation 13:16, John discusses the mark of the beast. “He also forced everyone, small and great, rich and poor, free and slave, to receive a mark on his right hand or on his forehead, so that no one could buy or sell unless he had the mark, which is the name of the beast or the number of his name.” (NIV) The text clearly states that people will be forced to receive a mark on their hand or forehead, and yet in his discussion concerning the mark of the beast, Schnabel states, “The expression ‘mark of the beast’ is a symbolic way of describing the state’s measures that are designed to ensure that people submit to compulsory idol worship.” (pg. 203) The book contains other examples where he interprets clear propositional statements as being symbolic, in keeping with his focus on symbolism as opposed to the literal meaning. 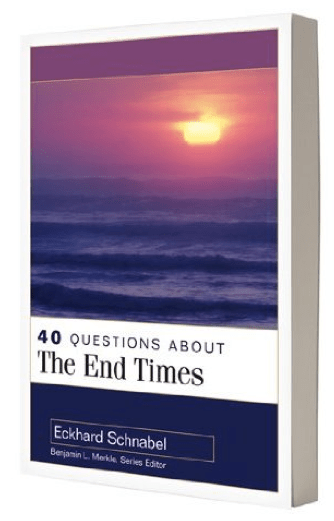 Eckhard Schnabel has written a book answering important questions about the end times. His book is scholarly and pastors will find it challenging as they wrestle with the text of end time prophecies. But I would not recommend this book to my congregation, because of Schnabel’s preference for symbolic interpretations over literal in clear texts. You are currently browsing the Working out Salvation with Fear and Trembling blog archives for May, 2012.